Albuquerque is a great place for wedding photography. We love the southwest styles, and the many options available in town, or nearby. There is such a variety of landscapes, including vistas of the Sandia mountains, the Rio Grande Bosque, and the sky-scape of urban down-town Albuquerque. We are fortunate to have gorgeous Native American resorts including Santa Ana Pueblo, Sandia Pueblo, and Isleta Pueblo adjacent to Albuquerque. As wedding photographers, we appreciate the beauty and the variety. These are some of our favorite venues where we have photographed. Top wedding venues listed have beautiful architecture, great indoor and out door locations for wedding photography, and friendly staff who are willing to work you and us. Most can accommodate large or small parties. Our top list includes: Isleta Resort and Casino, Albuquerque Hyatt Regency, Nature Pointe, Hyatt Regency Tamaya, Sandia Resort and Casino. Isleta Resort and Casino which is located just south of Albuquerque. Isleta has a golf course, and a beutiful resort with many options for receptions. Image below is really unique southwest architure called “The Jar”, which is one of our favorite places. Albuquerque Hyatt Regency lives up to the standards of Hyatt Regency properties. It is a first class venue, and has a really elegant wedding chapel which holds ~200 guests and many options for reception halls upstairs. Nature Pointe is about 15 miles east of Albuquerque in Tijeras canyon in the east Manzano mountains. It is a short drive from town, but enough to escape and get out of the city and into the mountains. The wood-work in the mountain-style venue with southwest accents, landscaping within the property, and views of the east mountains makes this a gorgeous setting for a wedding. Hyatt Regency Tamaya is located between Bernalillo and Rio Rancho on 500 acres within the Santa Ana Pueblo. There are gorgeous views everywhere including the golf courses, views of the Jemez mountains, and surrounding hills within Santa Ana Pueblo, the Rio Grande Bosque, and great views of the Sandia Mountains. Sandia Resort and Casino is located just on the north side of Albuquerque within the Sandia Pueblo Reservation located at the base of the majestic Sandia Mountains. You are struck by the beauty of Sandia Resort as soon you drive up. In addition to being at based of a 10,000 ft mountain, the building has beautiful southwest architecture and stunning views of both the Sandia Mountains and the city of Albuquerque. Sandia resort sits at a higher elevation than Albuquerque, so there are stunning views of city, especially the city lights as dusk sets in. As a wedding photographer, I love this place as there are so many options for gorgeous wedding photos. 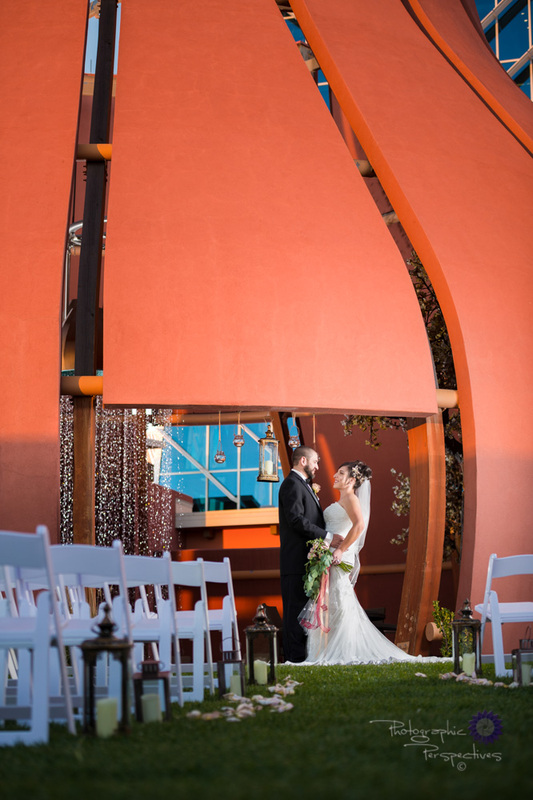 These are our favorite venues and recommended by many of Albuquerque’s top photographers. Feel free to click on the links above to the venues to open a page with more information, including galleries of wedding photos. We will be adding more photos to the galleries in the coming weeks, as well as more of our favorite venues soon. Servicing our clients is our top priority, but we also enjoy offering our expertise to potential clients or those couples who are just getting starting and looking for information. Are you interested in having us do your wedding photography? Click below to contact us and see if your date if available.